How to get there: From Las Vegas, take Hwy. 95 north. Continue on 95 where Hwy. 157 forks left towards Mount Charleston. Next you will pass under the Snow Mountain overpass, drive approximately 8 kilometer (5 miles) further, then locate a right turnoff called Corn Creek Road. There is a sign with this name at the turnoff. This road is dirt, but well kept. Drive 6.5 kilometer (4 miles) to the ranger station on your left hand side. If it is open, they will like you to register, that is, sign their visitor log. Almost immediately after leaving this station, make a left turm at the T-section. This road is called Alamo Road. Continue 24 kilometer (15 miles) along Alamo Road. You will pass a couple of roads that fork right, the last being Cow Camp Road (signed) before you arrive at the signed roadfork with Hidden Forest Road. Make a right at Hidden Forest Road (there is no forest!) and continue first flat, then gently uphill to the end of this road (about 5 kilometer) where there is a parking area. You are now near the entrance of Deadman Canyon. 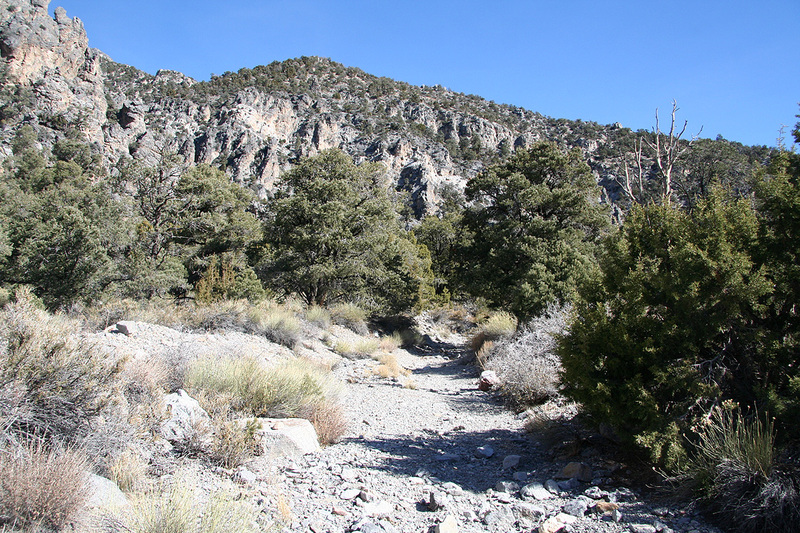 This is the trailhead, location N36:37.736, W115:17.273, elevation 1786 meter. The road was pretty rough when I drove it, in particular, the first few miles near the ranger station. In short sections of the road, there were too much and very loose gravel causing slight difficulties for an ordinary car. Rather careful driving, it took me almost one hour from the ranger station to the trailhead. A 4WD vehicle with somewhat higher clearance would have been preferable. The ranger claimed such a car was nessecary, however, this was fortuneately not the case. Route description: Leave the parking lot on a big trail and descend a few meter as you pass a closed gate. The trail quickly turns into the canyon and heads gently uphill. This trail is quite big and consists mostly of loose gravel. Several places the trail splits into two more or less parallel tracks that merge further ahead. Most often, one should see which alternative is best. A few places this is marked by a couple of small cairns. Stay in the main canyon as it winds its way with several big bends. There may be a couple of big, fallen trees that block the trail in a few places. Follow this very clear path until you hit the cabin (see picture below). 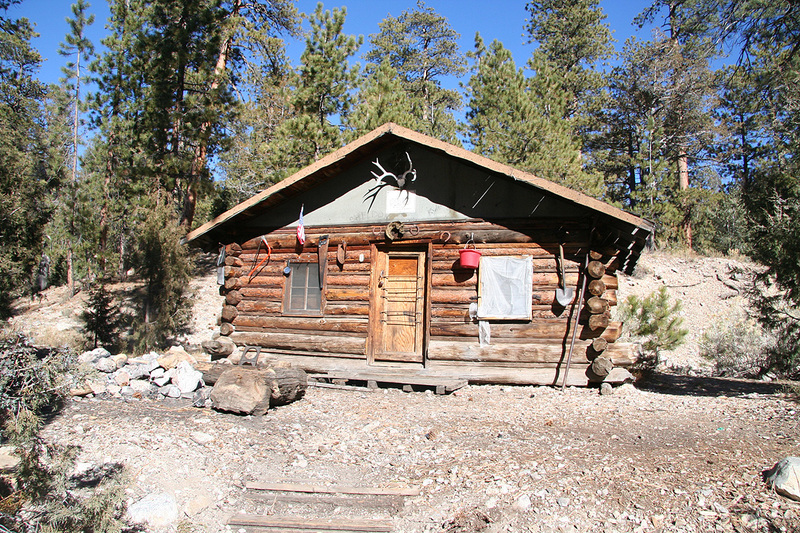 This cabin is located at N36:37.884, W115:12.474, elevation 2411 meter. From the cabin, several alternatives exist. 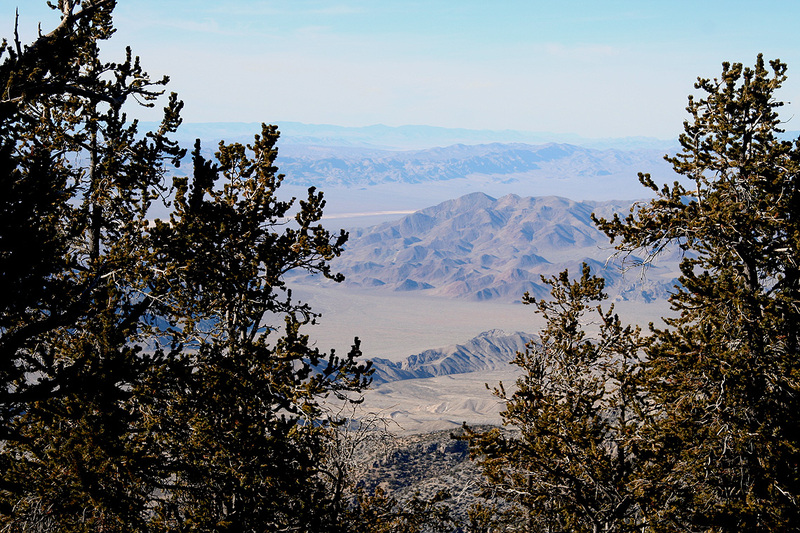 One can either hike up any of two smaller canyons or follow a ridge between these. I would recommend the ridge route as it is easy and provides a bit more view along the way. Immediately behind the cabin, ascend the gentle slope and continue uphill. There is no trail here, but the vegetation is easy and one should just ascend and continue to get as much uphill as possible. The terrain will gradually turn into a more distinct ridge. Stay on top of this ridge as it continues uphill. Soon, you will discover small cairns and small ribbons showing a trail along the ridge. These markers continue all the way to the summit of Hayford Peak. After a while you connect with a major ridge that runs perpendicular to your course and forms the west ridge of Hayford. Descend into the col that connects this ridge with Hayford Peak. A little, but not much elevation is lost while connecting to the final slopes leading to the top. Cairns and ribbons continue to indicate a path uphill, however there are many possible variations. There is a very short section with slightly steeper terrain among a few cliffs. Again, there are several easy routes between these. Finish the climb up the last gentle scree slope before arriving at the broad and rounded summit. Comments: I travelled to the USA with a scheduled visit in Laramie, Wyoming and then a week of supercomputing in Tampa, Florida. Thus, it seemed possible to squeeze in a weekend of hiking between these two assignments. In order to minimize snow, my focus pointed to peaks in Southern Nevada and Arizona. I left my friends Ellen and Sverre outside Denver on Friday morning and took a flight to Las Vegas. My tentative plan was to climb a mountain already this first day, however, this depended on a smooth travel without delays. Things went well until arrival at the Las Vegas airport. There, I waited close to one full hour before the first bags started to appear in the baggage claim area. My plan was Hayford Peak and from what I had read about this peak, time was at a premium. The one hour time difference between Denver and Las Vegas had now been wasted by exceptionally slow baggage handling. The rental car pickup was quick and soon I was on my way north along Hwy. 95. I left the trailhead at 1100, this was considerably later than anticipated (Las Vegas Airport and worse than expected road). I wondered how late it might be before my return, this was reported to be quite a long hike. I carried along my headlamp as well as extra batteries, it seemed that reaching the peak in daylight and possibly getting back into the canyon would be a goal to shoot for. I set a good pace, but was still a bit surprised when reaching the cabin at 1230. This was indeed a good sign, I rested a bit, then started up the hill directly behing the cabin. The hiking was quite easy and I soon reached the main (west) ridge. A short descent into the col, then an easy hike to the summit where I arrived at 1400, exactly 3 hours from the car. This hike can be highly recommended. The canyon is nice, sometimes quite narrow. The rock formations along the way are interesting with many sculptures and pinacles. The vegetation is similarly pretty rich and varied. The sun was shining most of the day and I saw absolutely nobody else. The ridge that I followed above the cabin was also quite easy to hike, it is a bit unclear where the trail is on its lower section, however this really does not matter at all. I signed the trail register, and had lunch while looking around and taking some summit photos. 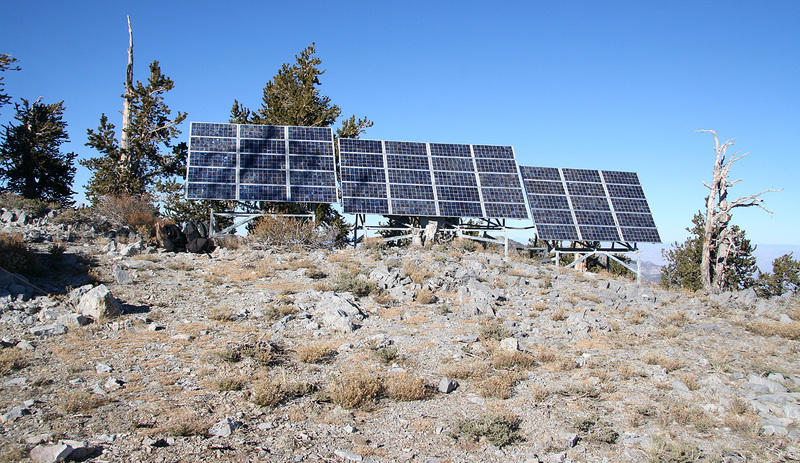 There are some antennas and a row of solar panels on the top. The summit view is partially obscured by trees. I started my return after about 20 minutes and reached the hut at 1515, followed by a leisurely hike back out the canyon reaching the car at 1630. The sun was low, but still hitting my car. A very nice and interesting hike and my weekend was indeed off to a good start. I had been convinced that this trip would be concluded after dark, a total trip time of 5.5 hours was quite a bit less than expected. This trip continued the next day with Charleston Peak. Las Vegas, as seen when flying in from Denver. Hayford Peak is the highest in the range that is seen behind the tower. 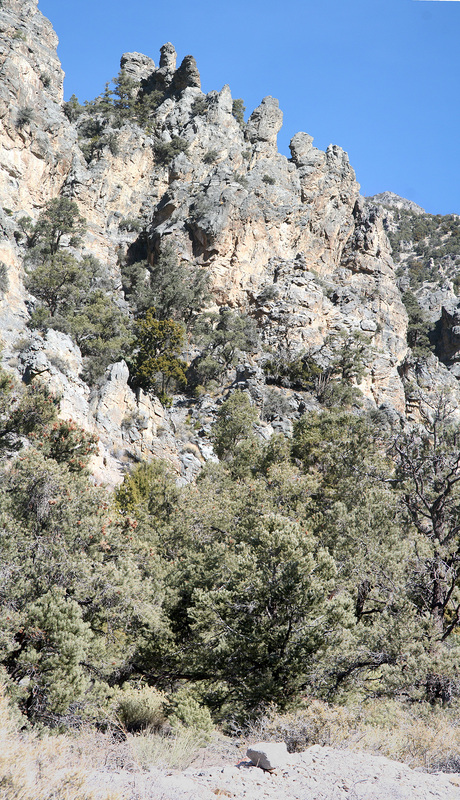 Deadmans Canyon, interesting and quite steep walls as I hike deeper into the canyon. Deadmans Canyon, the trail is mostly like this. The cabin, where the trail leaves the canyon. 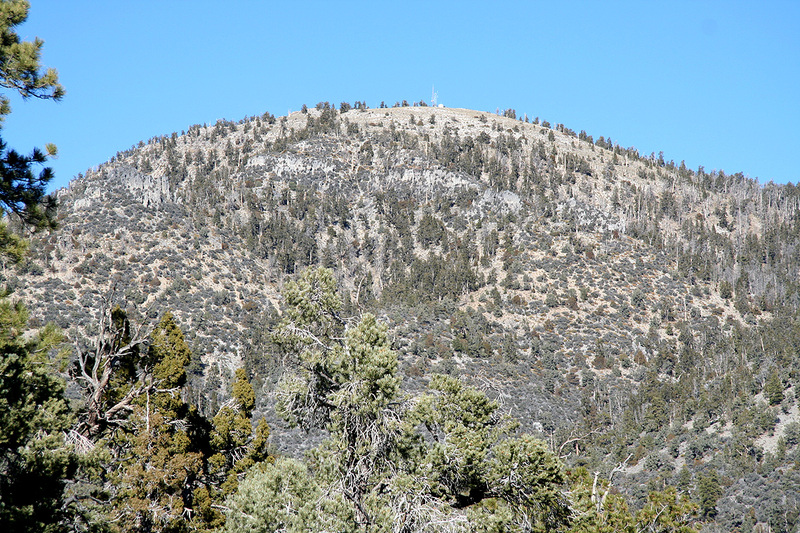 The summit, as seen when hiking on the ridge above the cabin.